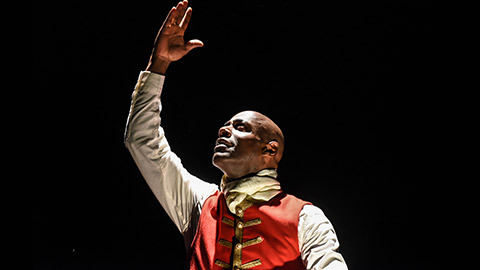 At the beginning of his one-man show, Paterson Joseph addresses the audience directly and confesses that he wrote Sancho: An Act of Remembrance because he always wanted to star in a costume drama. He then stops and briefly becomes Sir Peter Teazle from The School for Scandal to make the point. 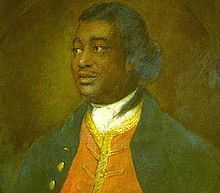 Joseph wrote Sancho, he contends, to fulfill this costume drama fantasy, blocked in its realization by his skin color, and also to put to rest the myth that there were no blacks in Britain in the eighteenth century. “But don’t worry,” he assures the audience, the show won’t be too overly political, and he promises to mix entertainment with, as the title suggests, remembrance of the first black man to cast a vote in a British election. Joseph uses the act of voting, along with the portrait of Ignatius Sancho painted by Gainsborough, to anchor his performance. The author, director, and star soon morphs into his eighteenth-century subject, first by simply pulling his socks up over his pants to approximate eighteenth-century style. Throughout the production he dons and doffs various pieces of clothing, but the transformations mainly emerge from posture, gesture, and pronunciation. Paterson Joseph as Sancho (and as several other characters) is charming and nimble throughout. He gives Sancho a slight lisp, as Sancho reportedly had a speech impediment, but he lisp also marks off when Joseph speaks as the actor/author and when he speaks as Sancho. In one scene, then, Joseph reads a letter written from Lawrence Sterne to Sancho in the character of Sancho doing an impression of Sterne, thus with both lisp and Irish accent. In another scene, he has Sancho recall his own brief acting career by reciting the speech from Thomas Southerne’s Oroonoko in which the royal slave pledges his love for Imoinda. The speech is not only beautifully delivered, but also, one imagines, not unlike the way actors presented such set pieces on the eighteenth-century stage as feats of elocution. Joseph takes us through Sancho’s life, playing Sancho as a frightened child; a cooperative but restless adolescent in the household of the three maiden sisters to whom he had been given as a gift; an eager student excited by an education made possible by John Montagu, 2nd Duke of Montagu; a butler in the Montagu household; and then later as a middle-aged shopkeeper with a wife and children. Joseph enlivens the production with Sancho’s impressions of the people who fill his life: the racist ladies who first own him; his beloved West Indian wife; his five-year-old son. Joseph keeps up an extraordinarily high level of energy throughout. He portrays his subject with admiration, documenting his accomplishments (writing, composing), his vulnerabilities (gambling), his losses (his parents; a beloved daughter), and the many injustices he faced. Joseph suggests parallels between Sancho’s frustrated career on the stage and enduring prejudices over color in casting. His moving portrait of Sancho begins with Gainsborough’s painting to suggest the importance of his subject and ends with Sancho casting a vote in favor of an abolitionist candidate. Sancho: An Act of Remembrance entertains and educates. Sometimes the performance felt a little piecemeal, with many wonderful scenes but without a full sense of Sancho himself. Joseph seems to have resisted the temptation to fill in too much from imagination. It also seems more possible than Joseph acknowledges, at least of late, to see “costume dramas” with mixed-race or race-blind casting, although that doesn’t diminish Joseph’s point about acting while black. From the teasers embedded in Sancho, I would love to see Joseph in a full production of Southerne’s Oroonoko—or as Peter Teazle in The School for Scandal. Sancho: An Act of Remembrance takes part in the crucial project of rethinking our picture of the British eighteenth century not just in scholarly writing, but in more broadly public venues as well. True to his word, Joseph achieves this with subtlety and charm, offering a memorable Sancho and a memorable performance.